On Oct. 2, the Meridian Township Board voted 6-1 denying Jim Giguere’s request to rezone approximately 7.36 acres of residential property. Their decision means that no more than seven homes can be built off Hulett Road, near the Sanctuary Neighborhood. Township Treasurer Julie Brixie said that her vote against the rezoning request was not a difficult decision to make. Alina Gorlick, a 10-year Meridian Township resident, said she felt extremely happy about the board’s decision. Homeowners in the area said that builder Jim Giguere promised that this land would never be developed. According to a Sept. 20 article in the Lansing State Journal, residents said that Giguere used the vacant wooded area behind the homes as a selling point when speaking to prospective buyers. Additionally, the article mentions that the residents only learned about the rezoning request after seeing a sign that said “pending rezoning” in front of the wooded area. Township Clerk Brett Dreyfus said that no one submitted a document stating that the area cannot be developed. Since there was no legal backing as to what was promised or not, Giguere has the right to build up to seven lots. Dreyfus said that this was the most ideal compromise in this situation but community members did not agree. “We have had a very interested audience that weighed in and a lot of citizens had concerns,” said Dreyfus. Gorlick said she believes that many more trees will be destroyed when building eight houses in the same area because of the little space that will be left in between the houses. “He is designating the wetland area which is good but everything else will be removed,” said Gorlick. Residents of Gorlick’s subdivision collected 81 signatures on a petition to oppose rezoning. “I don’t think there has been a demonstrated public need for the rezoning,” Brixie said. She said she believes that there is no reason why the property cannot still be developed with the current zoning category. Giguere prepared a supplemental information packet with details of the development’s history, a wetland study and the benefits of rezoning. “Not everybody’s always happy with the the end results,” said Dreyfus. Giguere expressed his concerns with developing seven rural residential lots which are 200 feet wide versus 80 feet wide. Dreyfus has faith that the residents and Giguere will be able to reach a compromise. “I can only hope that Mr. Giguere still puts his best foot forward to come up with a reasonable development plan that maximizes environmental protection, maximizes esthetics and reduces the impact on the neighborhood,” said Dreyfus. Giguere said the next step for him is to meet with the community’s homeowners to discuss rezoning the area into a different category in which both parties can agree on. 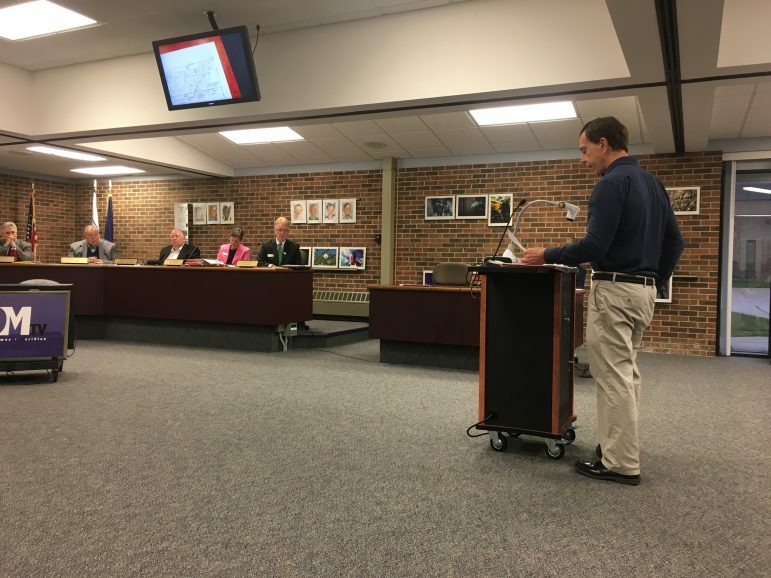 Also, other topics discussed at the meeting included the Medical Marijuana Ordinance, the Marsh Pointe PILOT Amendment and Urban Service Boundary Amendment. Jim Giguere voices his rezoning request. Alina Zhuravel is student journalist at Michigan State University. Her work been published in Spartan Newsroom and VIM magazine. She is majoring in Broadcast Journalism and minoring in Documentary Production and Health Promotion. OKEMOS- On Monday, Feb. 27, the Meridian planning commission meeting received one of the largest turnouts that they’ve had in months.